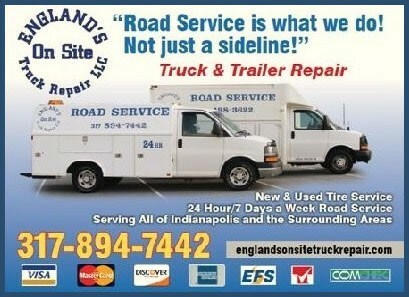 England's On Site Truck Repair Service is a road side service repair company in the Indianapolis / Greenfield area that specializes in semi truck & trailer repair. We offer 24/7 Truck Road Service on Semi Trucks, Semi Trailers, Buses, Tires, and RVs. Contact our mechanics in Indianapolis at 317-894-7442 for all of your semi truck repair, semi mobile repair, trailer repair and semi truck tire repair needs. Offering road side repair services for all of Indianapolis and the surrounding areas including central Indianapolis, I-465, I-70 East of Indianapolis, and I-69. Our Mobile Repair Mechanics are very experienced and knowledgeable and will come to you for your convenience!